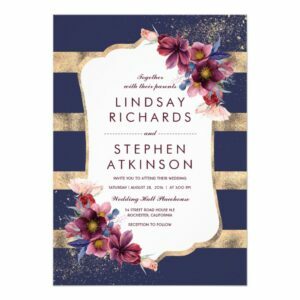 A Sunflowers Black White Striped Invitation Suite, with items from invitation to RSVP card, Thank You Card, Stickers, Address Label, Sign Poster, and more. 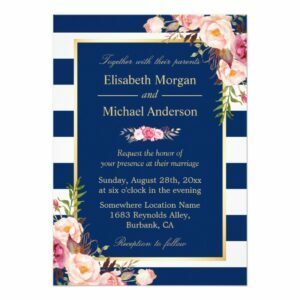 A Navy Blue Striped Pink Floral Invitation Suite, with items from invitation to RSVP card, Thank You Card, Stickers, Address Label, Sign Poster, and more. Nantucket Red Mattress Ticking Stripes Throw Pillows – Nantucket Red Mattress Ticking Stripes – Nantucket Reds were originally inspired by cotton trousers worn in Brittany. A characteristic of Reds is that they fade to a “dusty rose” as they age. Since their inception, the cotton canvas pants have been marketed as shorts. The distinctive salmon pink color has since been used on hats, shirts, sweaters and socks. Reds are worn predominantly by summer residents of Nantucket, Martha’s Vineyard, and Cape Cod in place of khakis or chinos. Wide Dark Black Mattress Ticking Stripes on Cream Throw Pillows – Wide Dark Black Mattress Ticking Stripes on Cream – The stitched and woven straight vertical lines of one thin stripe either side of a wider stripe are found in the traditional mattress ticking pattern.The classic black and cream ticking seen in mattresses, bedding and pillow covers is known the world over and is here in a wide version. White Matress Ticking Stripes on Soft Summermint Green Throw Pillows – White Matress Ticking Stripes on Soft Summermint Green – The stitched and woven straight vertical lines of one thin stripe either side of a wider stripe are found in the traditional mattress ticking pattern.